The “Habitat Marocain” housing project was built in Casablanca between 1954–56 by two Swiss architects, Jean Hentsch (1921–84) and André Studer (1926–2007). The complex was part of the reconstruction and expansion scheme for the city under the French colonial administration in Morocco after World War II and meant to house local inhabitants rather than European expatriates. This lead to a culturally specific architectural approach. “Habitat Marocain” is a prime example for the interplay between formal and informal building. This book investigates the contradictions between the architects’ cultural assumptions and the actual way of life of inhabitants. It documents the ethnographic influence on the design for the entire dwelling and shows the various transformations to the buildings later made by the residents. The rich material presented, including many photographs by architect André Studer, plans and other documents, illustrates the complex relations between ethnographic imagination, design synthesis and the increasingly informal further development once construction was completed. 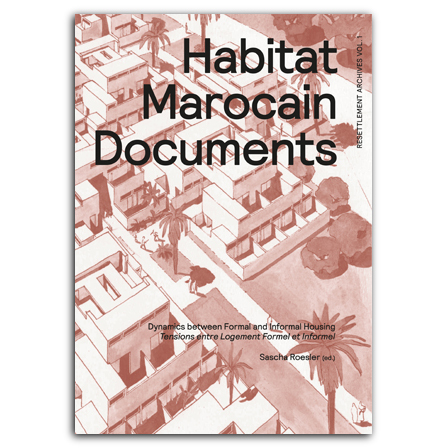 Habitat Marocain Documents tells the project’s entire history from early planning stage to first occupancy and beyond. The book reveals a complex process of research, design, construction, and inhabitation that continues until the present day. Winner of the DAM Architectural Book Award 2016.
is an architect and researcher and currently a Senior Researcher and Module Coordinator at ETH Zurich’s Future Cities Laboratory in Singapore. He studied architecture at ETH Zurich and Theory of Design und Art at Zurich University of the Arts (ZHdK).